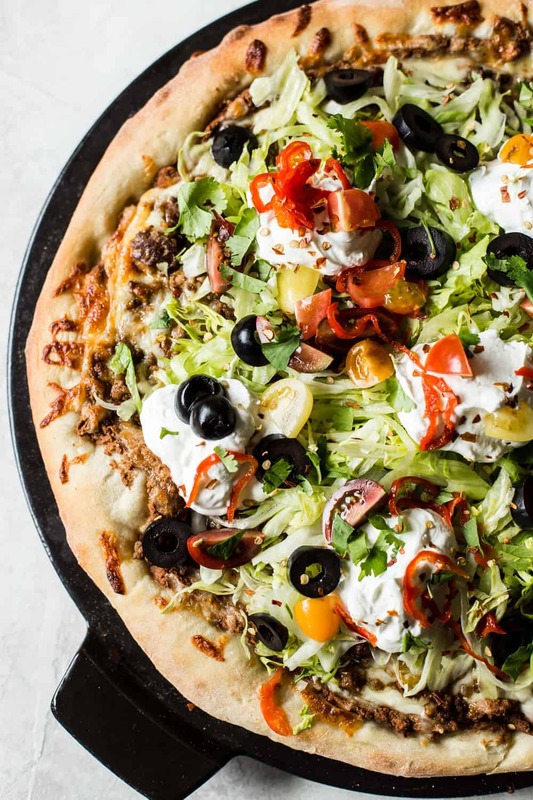 Two classic family favorites, pizza and tacos, come together in this easy weeknight meal that is destined to become a favorite in your home. Hi friends! Holly here from The Modern Proper. I’m excited to share this fun twist on two classic family weeknight traditions, pizza and Tacos- I like to call it Taco-Pizza night! Combining my family’s two favorite meals in one has long been a winner in our home, and I’m confident it will be in yours, too. This recipe is an at-home version of one of my favorite pizzas that I grew up eating at a local family-owned pizzeria…Mexican pizza! I crave it often, and because it’s so easy to make at home I can make it in a flash whenever I’m in the mood. With the exception of this salami, jalapeño, and green olive pizza with honey, it’s the only pizza I can happily eat over and over again and not grow tired of. To make this beauty I start with a store bought crust, because who has time to make their own dough? Then I spread a layer of spiced up refried beans onto the dough (the same way you would traditional pizza sauce). Next, I sprinkle the pizza with seasoned taco meat. 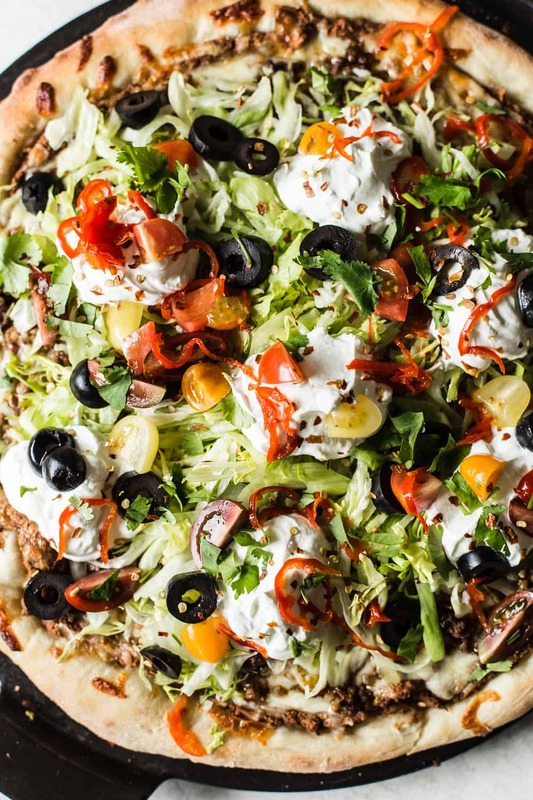 If you are trying to make dinner in less time or are looking for ways to make more meat-free meals then skip this step and let it be Vegetarian Mexican Pizza to the rescue. Finally, before plunging it into the oven, cover it all with a generous layer of shredded cheese. I like to use straight up mozzarella, but you could also just grab a bag of shredded mexican cheese blend. Easy peasy. Once your glorious Mexican pizza has come out of the oven, you’ll want to top it with all of your favorite taco toppings. Personally, I like to go heavy on thinly shredded iceberg lettuce, olives, tomatoes and of course, sour cream. You can even add some pepperoncinis or Mama Lil’s peppers (my personal fave) to spice things up a bit. 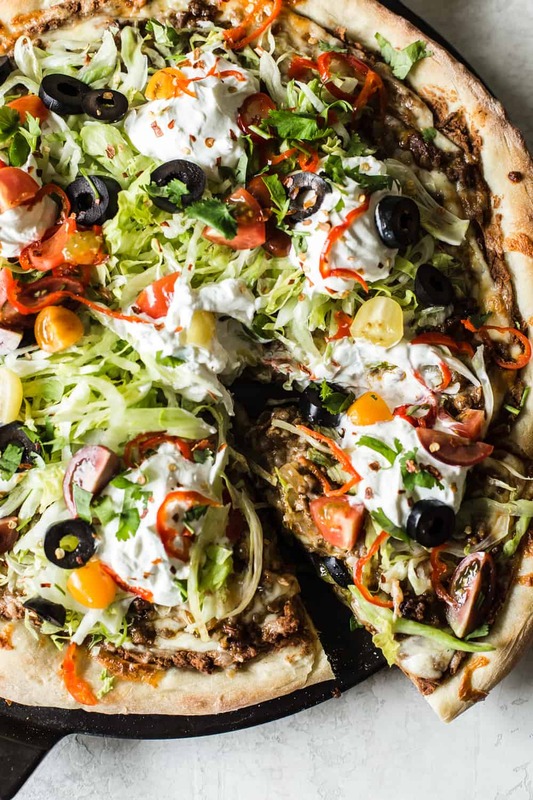 This Mexican Pizza is the perfect quick, no fuss weeknight dinner, because many of the toppings can be prepared ahead of time making the dinner rush hour go that much smoother. I hope this pizza makes it into your family’s dinner rotation, and if it does, it will most likely be there to stay, because it’s just that good. 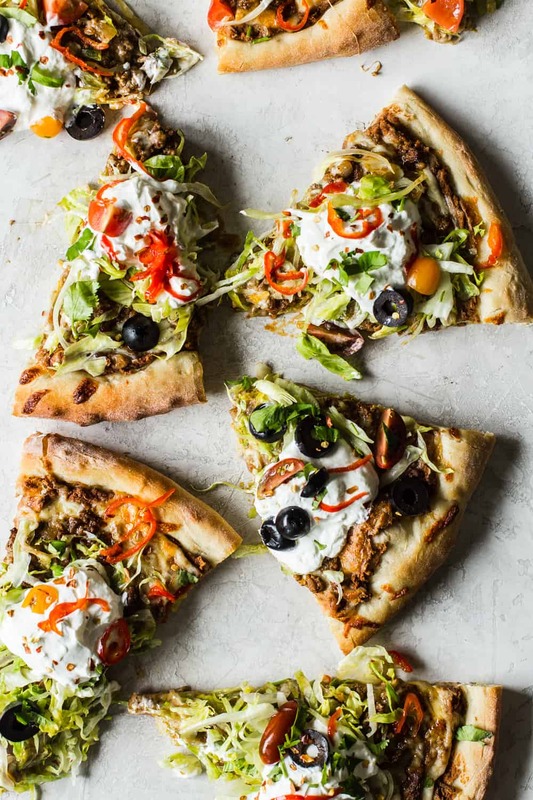 If you’re looking for other easy, family-friendly pizza recipes, be sure to try out one of The Modern Proper’s other favorite recipes Thai Chicken Pizza. Set a pizza stone on the bottom of the oven and preheat the oven to 450°. In a pan set over medium heat, brown the meat and onions, until cooked through and tender. Drain. Follow the dirrections on the packet of taco seasoning. Set aside. In a small bowl, combine the refried beans with the chili powder and cumin and mix until fully incorporated. Stretch the pizza dough to a 12-inch round and transfer to a cornmeal or flour-dusted cutting board. Spread the bean mixture on top, leaving a ½-inch border. Sprinkle with ¾ of the cheese followed by the taco meat, then remaining cheese. Slide the pizza onto the preheated stone and bake for 12-15 minutes, until the bottom is crisp and the cheese is bubbling. Top with the lettuce, dollops of sour cream, tomatoes, olives and peppers.